Web sites selling cigarettes: how many are there in the USA and what are their sales practices? OBJECTIVES To estimate the number and geographic location of web sites selling cigarettes in the USA, and to examine their sales and marketing practices. METHODS Comprehensive searches were conducted using four keyword terms and five popular internet search engines, supplemented by sites identified in a news article. Over 1800 sites were examined to identify 88 internet cigarette vendors. MEASURES Trained raters examined the content of each site using a standardised coding instrument to assess geographic location, presence of warnings, products sold, and promotional strategies. RESULTS Internet cigarette vendors were located in 23 states. Nearly half (n = 43) were located in New York state, and many were in tobacco producing states with low cigarette excise taxes. Indian reservations housed 49 of the 88 sites. Only 28.4% of sites featured the US Surgeon General's health warnings and 81.8% featured minimum age of sale warnings. Nearly all sites (96.6%) sold premium or value brand cigarettes, 21.6% sold duty-free Marlboros, and 8.0% sold bidis. Approximately one third featured special promotional programmes. CONCLUSIONS Internet cigarette vendors present new regulatory and enforcement challenges for tobacco control advocates because of the difficulty in regulating internet content and because many vendors are on Indian reservations. To the best of our knowledge, no published peer reviewed studies have examined web sites that sell cigarettes. The present study attempts to fill this void in the literature by using a rigorous internet based searching and sampling methodology to estimate the number of internet cigarette vendors. In addition, a standardised coding system is used to determine their characteristics including geographic location, presence of age and health warnings, and sales and marketing practices. There is currently no standardised method of sampling content featured on the world wide web.25 26 In the absence of standardised protocols, we employed a searching strategy similar to those utilised in studies of Ewings sarcoma27 and herbal remedy web sites.28 Both of these studies identified their study sample by entering multiple keywords into multiple search engines and by assessing either the first 10027 or 25028 hits from each search to determine web site eligibility for the study. To identify the best keywords we began by first locating approximately a dozen ICVs and examining the words featured on each site's main page and metatags. Metatags provide keywords to help search engines find the site. Most browsers have a feature that allows users to view the underlying source code, including metatags. These approaches yielded a pool of 11 potential search keywords (cheap cigarettes, cheap smokes, cheap tobacco, discount cigarettes, discount smokes, discount tobacco, low price cigarette, inexpensive cigarette, mail order cigarette, online cigarette, and tax free cigarette). All 11 potential keywords were then typed into six major search engines used in an earlier study of search engine coverage31 to determine which keywords were most efficient in identifying ICVs. “Discount cigarette”, “cheap cigarette”, “mail order cigarette”, and “tax free cigarette” were selected as the four best keywords because they were the most efficient in locating ICVs, and at least one of these four keywords appeared in nearly all of the metatags for sites that were found using the other seven potential keywords. To identify the search engines, we relied on popularity rankings. Media Metrix (www.mediametrix.com) ratings for August 1999 (the most current ratings at the time of the data collection) were used to identify the top five most widely used internet search engines. The four keywords were entered into these search engines, except for Yahoo! (http://www.yahoo.com), which is a category based internet search catalogue that required a slightly different strategy. Web sites on Yahoo! are organised hierarchically within categories. To identify the Yahoo! 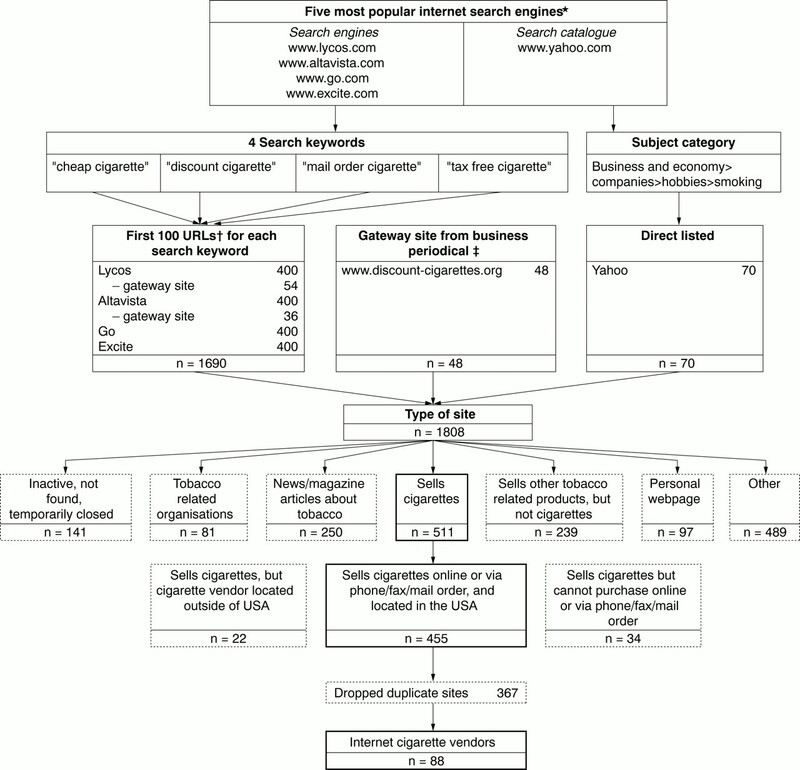 categories for cigarette vendors, two keywords—“smoking” and “cigarette”—were searched. The keyword “smoking” yielded 36 category matches and the keyword “cigarette” yielded five category matches. Of these 41 total category matches, only one unique category listed cigarette vendor sites: business and economy> companies>hobbies>smoking. This searching strategy is depicted in fig 1. Web site identification procedures and inclusion criteria for study of internet cigarette vendors. *As ranked bywww.mediametrix.com for August 1999. (Accessed November 1999. The top five search engine sites remained unchanged in a subsequent ranking for November 1999).†URL, universe resource locator.‡Business Week. Larry Armstrong “All the tar and none of the taxes.” 13 December 1999, p 8. Internet cigarette vendors were identified through searches conducted during a two week period in November 1999 by two raters (AK and RW). To assess a manageable number of web sites, all Yahoo! category search results and the first 100 “hits” for all keywords on the other four search engines were analysed to determine whether or not they were potential cigarette vendors. The searches also yielded two “gateway” sites that listed links to other cigarette vendor sites. All of these links were pursued to determine whether the listed sites met study inclusion criteria. Two months following the initial search, a Business Week article on internet cigarette vending published the URL for another gateway site <http://www.discount-cigarettes.org> that listed links to 48 internet vendors. To be as comprehensive as possible, links on this gateway site were also included. A total of 1808 sites were examined to determine their eligibility for the study (fig 1). For the purpose of this study, a US internet cigarette vendor was defined as a web site that: (1) sells cigarettes; (2) allows the purchaser to order either online or via phone/fax/mail order; and (3) is based in the USA. Cigarettes were broadly defined to include name brand, generic brand, own brand, and clove cigarettes (Kreteks), as well as bidis. Sites that sell other tobacco products such as cigars and smokeless tobacco but do not sell cigarettes were excluded. Web sites of retail tobacco shops that only advertise cigarettes but do not offer a way to purchase them online or by phone, fax, mail order were excluded. Because we were primarily interested in vendors that must comply with US laws and regulations governing cigarette sales, only US based cigarette vendor sites were included in this study. Similar to other studies of internet web sites,27 multiple raters determined the eligibility of the sites. To ensure consistency in coding, the inter-rater reliability was initially assessed on a sample of 100 sites. There was 97% agreement (κ = 0.91, p < 0.001). Given this excellent level of agreement, one rater was used to determine the eligibility of the remaining 1708 sites. Of the total 1808 sites examined, 455 met the inclusion criteria. The names and web site universal resource locator (URL) of these 455 were then examined to rule out duplicates. For uncertain cases, contact information such as phone number and mailing address for both web sites was compared to determine if they were of the same origin. The site was contacted directly if more information was needed. After expunging duplicates, 88 unique ICV sites comprised the study sample (fig 1). Web researchers recommend keeping downloaded records of web sites because they are not permanent.25 The final sample of unique ICV web sites was downloaded and archived using WebRecord's Research Pro Version 2.0 in November 1999 and January 2000 (for the additional sites identified from the Business Week article). Four sites could not be archived using this software, so hard copies of all pages of these sites were printed and used for content analysis. A standardised coding form and codebook were developed and both raters were trained to use these instruments. Both raters independently coded all 88 web sites. Raters thoroughly explored all areas within the web site. Forms were sent to a commercial data entry firm and any discrepancies between raters were resolved through discussion with the first author (KR). The content analysis rating form reflected four areas of assessment: (1) web site location and characteristics; (2) health and age warnings, (3) products sold and purchasing methods; and (4) promotional strategies. Information collected included the city and state location, and whether it was on an Indian reservation. Web site characteristics included number of links present on the site and whether the vendor was an actual retail store. Web sites were categorised as retail stores if information such as store hours, directions to store, or pictures of the actual store and/or store owners were posted. The presence of one of the four rotating US Surgeon General's health warnings was coded. Sites with generic warnings such as “Health warning: if you do not smoke, please do not start now!” <http://www.cheap-tobacco.com> were not counted. Warnings about minimum age to purchase cigarettes were also assessed. Raters collected information on the number of cigarette brands, the types of cigarette, tobacco, and non-tobacco products sold, whether cigarettes were sold by the pack or carton, and the minimum purchase necessary to process the order. Data on purchasing methods included accepted method of payment (for example, credit card, money order/certified check) and whether cigarettes could be ordered online, by mail, fax, or phone. The mode of delivery was also assessed. Information was collected on special promotions and cigarette advertising, such as reduced price specials, free gifts with purchase, and weekly/monthly specials. Data were collected on whether the site mentioned the Jenkins Act, a US Federal law that regulates mail order sales of cigarettes. This was relevant because web sites ship their orders through mail. Advertising strategies, such as explicit promotion of tax-free cigarettes and posting of scanned cigarette package images were also assessed. Descriptive statistics were computed using SPSS Statistical Software, version 10.32 Confidence intervals were not calculated because this study attempted to identify a population of internet cigarette vendors and did not sample from a known population of ICVs. A total of 88 unique US based ICVs were downloaded and analysed. Vendors were located in 23 states (fig 2), with most in New York (n = 43) (fig 3), Virginia (n = 9), and North Carolina (n = 4). Over half of the ICVs were located on Indian reservations (n = 49), and 80% of the ICVs on Indian reservations were based in New York state. Of the 43 ICVs located in New York, 90.6% of them were on Indian reservations. Number of internet cigarette vendors by state, USA, November 1999 to January 2000 (n = 88). State location of six internet vendors could not be determined based on information from the website or personal inquiry. Number and geographical distribution of internet cigarette vendors in New York state, November 1999 to January 2000 (n = 43). Thirty one per cent of ICVs (n = 27) were retail shops that had taken their business online. These retail shops varied from a local “mom and pop” store such as Tony's Food Mart (www.tonysfoodmart.com) in North Carolina to Big Bear Discounts (www.bigbd.com), a Seneca owned business located on the Cattaraugus Indian Reservation in Western New York (table 1). Thirty six ICVs had links to other sites, with wide variation in the number of external links. Five sites linked to pro-smoking or smoker's rights organisations, 10 sites had links to other tobacco related chatrooms or web pages, and several had links to tobacco vendors (n = 3) or tobacco companies (n = 3). Only 28.4% of the ICVs featured a US Surgeon General's warning (n = 25), whereas the majority (81.8%) featured a warning about the minimum age of sale for tobacco products (table 2). Internet cigarette vendors offered various methods to purchase and receive delivery of cigarettes. A buyer could order directly online (n = 75), or by phone (n = 72), fax (n = 58), or mail (n = 68). Credit cards were the most commonly mentioned method of payment, accepted by 90.9% of ICVs. Many ICVs also allowed alternative methods of payment including money order and/or certified checks (n = 60), personal checks (n = 51), and ATM (automatic teller machine) cards (n = 2). The most common mode of delivery offered was UPS courier service (n = 46), followed by US postal service (n = 33) (table2). ICVs sold a wide range of cigarette products including premium, discount, and value brand cigarettes (97%), clove cigarettes (18%), and bidis (8%). Eight ICVs sold their own cigarette brands, such as Cherokee cigarettes at <http://www.cdbn.com>. Nineteen ICVs also sold duty-free Marlboros, grey market cigarettes manufactured for export that are now banned under the Master Settlement Agreement. Half of ICVs sold 50 or more different cigarette brands on their web sites. Some sites such as <http://www.4discountcigarettes.com> advertised selling over 300 cigarette brands. Four sites allowed one pack as the minimum order, and almost a third of the sites required a minimum purchase of four or five cartons to process the order. Many of the ICVs offered a variety of special promotions. Twenty sites offered reduced prices while 16 allowed buyers to create standing orders to receive regular shipments of cigarettes. Twelve sites offered weekly/monthly specials and three offered gifts with purchase. Although 29 sites promoted selling “tax-free cigarettes,” only four mentioned the Jenkins Act. Other advertising strategies employed by ICVs included scanned images of cigarette packs or cartons (n = 36) and advertisements for specific tobacco brands (n = 7). The goal of this study was to estimate the number of internet cigarette vendors in the USA, and to examine their sales and marketing practices. A comprehensive internet searching strategy was conducted during November 1999 and January 2000. A total of 88 unique internet cigarette vendors in the USA were identified, 43 of which were located in New York state. There were about as many internet vendors in New York state as the rest of the other 49 states combined. A total of 15 sites were located in three tobacco growing states, Virginia, North Carolina, and Kentucky, which have the lowest excise taxes on cigarettes in the country. Surprisingly, this study did not identify any internet cigarette vendors in California, a state with high rates of internet access33 and over 35 000 retail tobacco outlets. Nationally, there are approximately 534 000 retail outlets selling tobacco products4 and this study identified only 88 internet cigarette vendors. Although over 44% of US businesses sell goods or services over the internet,6 it appears that fewer than 1% of retail outlets sold online at the time of this study. Moreover, the majority of internet vendors sold exclusively through the internet. One of the thorniest regulatory issues will be how to handle sales from Indian reservations. There are currently 558 federally recognised tribes in the USA. In New York, members of the Seneca Nation, for instance, claim that their 1842 treaty with the USA was a declaration of their sovereignty and freedom from external controls. In addition, they claim that New York civil laws do not apply to them because reservations are considered “interstate” by federal law.19 In contrast, the New York attorney general's office stated that it did not claim jurisdiction over transactions that occur on the reservation, but it did claim jurisdiction when deliveries were made from the reservation to other locations. The US Supreme Court has ruled that tax-free sales provisions apply only to Indians selling to other Indians.24 The large number of ICVs on Indian reservations in New York state came from vendors in the Seneca Nation. A recent newspaper article highlighted a native Seneca Indian who sold cigarettes by mail order for 14 years and who has been helping over a dozen Senecas establish their own web sites to sell cigarettes.24 This may partially explain why New York has more internet vendors than other states with large Indian populations such as New Mexico and Arizona. Mandating age verification at delivery presents some difficulties for couriers. UPS currently has provisions to allow age verification, but Federal Express and the US postal service do not. The present study found about one fourth of sites featured official health warnings, which is somewhat higher than a recent study of internet cigar vendors that found only 3.5% of sites featured health warnings.43 Under legislation introduced by US Congressman Meehan on 4 October 1999 entitled the “Internet Cigarette Warning Label Act” (H.R. 3007), internet vendors would be required to abide by the Federal Cigarette Labeling and Advertising Act that has required Surgeon General's warnings to appear on cigarette packaging and print advertising. It would also authorise the Federal Trade Commission to establish conspicuous warning labels for web sites. This legislation never made it beyond committee and expired in the 106th session of the US Congress. There are several limitations of the present study. Firstly, this study examined the written content featured on internet cigarette vendor web sites, but did not determine the actual practices of vendors. A second limitation was that our searching strategy might have missed some sites. Although we used a rigorous searching strategy using multiple keywords and search engines, even the best search engines do not cover the entire internet.31 Only about one third of sites feature metatag keywords, and search engines are more likely to select sites that are “popular” or linked to other sites.31 Therefore, our estimate of 88 internet cigarette vendors for early 2000 should be considered a lower bound estimate for the time frame of our search. Finally, one cannot be certain that the web sites identified by this study are representative of other ICVs not identified. A prior study found that there are a substantial number of web sites selling cigars, but there are no published empirical studies examining the sales practices of web sites selling cigarettes. As states increase their cigarette excise taxes, there is speculation that the internet will serve as an unregulated and ready source of tax-free or low tax cigarettes. This study used a rigorous internet searching strategy to identify 88 web sites selling cigarettes in the USA. Most sites sold cigarettes only through the internet and not from a retail outlet. Some sites sold duty-free cigarettes, which are now banned under the Master Settlement Agreement. Sites also advertised that they sold cigarettes tax-free. Over half of the web sites were located on Indian reservations, which creates additional complications for regulating their sales practices because they are considered sovereign territory. Epidemiologic studies are also needed. Studies should examine: what percentage of youth and adult smokers buy cigarettes on the internet, whether this is a supplement to retail purchasing or a sole source, and the primary reasons for buying online. Answering these questions will help identify what percentage of overall cigarette sales occur online and should help policy makers and state governments evaluate the amount of cigarette excise tax revenues that are not being collected. This is perhaps the first study of its kind to estimate the number of internet cigarette vendors and their sales practices. The emergence of internet cigarette vendors presents many challenges for tobacco control advocates. State and federal legislation and enforcement will probably be needed to ensure that appropriate excise taxes are paid on cigarettes, that grey market cigarettes are not sold online, and that youth access to tobacco products is restricted. The findings from this study will be helpful in developing public health approaches to addressing the unique problems posed by internet cigarette vendors. (1999) Cigarette smoking among adults—United States, 1997. MMWR Morb Mortal Wkly Rep 48:994–999. (1998) Tobacco use among high school students—United States, 1997. MMWR Morb Mortal Wkly Rep 47:229–233. (1994) Preventing tobacco use among young people. A report of the Surgeon General, 1994. (Public Health Service, Centers for Disease Control and Prevention, Office on Smoking and Health, Atlanta, Georgia) . (US Government Printing Office Publication No S/N 017-001-00491-0.). (2001) , et al. What is the potential cost-effectiveness of enforcing a prohibition on the sale of tobacco to minors? Prev Med 32:168–174. United States Department of Commerce and the National Telecommunications and Information Administration.Falling through the net: toward digital inclusion—a report on American's access to technology tools. Washington DC, 2000..
United States Internet Council & ITTA Inc.State of the Internet 2000. Washington DC; 1 September 2000..
Associated Press. NY jumps to No 1 cigarette tax. Albany, New York, 1 March, 2000..
Fishman JA, Allison H, Knowles SB, et al. State laws on tobacco control—United States, 1998.MMWR Morb Mortal Wkly Rep1999;48(SS03):21–62..
(1996) Cigarette smoking before and after an excise tax increase and an antismoking campaign—Massachusetts, 1990-1996. MMWR Morb Mortal Wkly Rep 45:966–970. (1995) Reducing cigarette consumption in California: tobacco taxes vs an anti- smoking media campaign. Am J Public Health 85:1218–1222. Lewit EM, Hyland A, Kerrebrock N, et al. Price, public policy, and smoking in young people. Tobacco Control 1997;6(suppl 2):S17–24..
(1991) , et al. The effects of excise taxes and regulations on cigarette smoking. J Health Econ 10:43–64. Demer L. Cigarettes sales down, revenue up.Anchorage Daily News. Anchorage, Alaska; 14 September 1999..
Warren J. Cigarette sales off 29% in state since 50-cent tax hike. Los Angeles Times. Los Angeles, California; 1999:A3..
Howe K. Price rise puts heat on smokers: Run on cigarette sales and Internet vendors. San Francisco Chronicle. San Francisco, Californa; 1998:A1, A10–11..
O'Connell V. Cigarette price boosts send smokers scurrying for cheaper brands, outlets. Wall Street Journal. New York, NY; 1998:A4..
Staff. Drag net: cigarette buyers may go online to avoid new taxes. San Jose Mercury News. San Jose, California; 1998:1A, 18A..
Scripps Howard News Service. E-cigarettes: discount sales of tobacco on web threaten US efforts to reduce smoking. Winston-Salem Journal. Winston-Salem, North Carolina; 2000..
Delio M. E-tailers fuming over NY law. ; 2000. Wired.com. Koury C. Internet tobacco dealers targeted in AG's sting.Telegram & Gazette; 2000..
FIA International Research. Cigarette smuggling and the internet. New York; August 2000..
Armstrong L. All of the tar and none of the taxes.Business Week; 1999..
Said C. Online sale of tobacco drawing a fight; critics say tax, age laws must apply to web market. San Francisco Chronicle. San Francisco, California; 2000..
Beebe M. Tobacco's new road. The Buffalo News. Buffalo, New York; 1999..
(1999) Analyzing the web: directions and challenges. in Doing internet research: critical issues and methods for examining the net. ed Jones S (Sage, Thousand Oaks, California), p 299.
, eds (1998) Analyzing media messages. (Lawrence Earlbaum, Mahwah, New Jersey). (1999) , et al. Evaluation of cancer information on the Internet. Cancer 86:381–390. (2000) The validity of health claims on the world wide web: a systematic survey of the herbal remedy Opuntia. AJHP 15:21–28. Graphic Visualization and Usability Center.GVU's 10th WWW User Survey: URL:; October 1998. http://www.gvu.gatech.edu/user_surveys/survey-1998-10/. (1999) Searching the web: a survey of EXCITE users. Internet research: electronic networking applications and policy 9:117–128. (1999) Accessibility of information on the web. Nature 400:107–109. Norusis J. SPSS for Windows, Release 10.0. Chicago, Illinois; 1999..
(2000) Falling through the net: toward digital inclusion. (USDC, Washington DC). Rubin R, Charron C, Dorsey M. Online tobacco sales grow, states lose. Cambridge, Massachusetts: Forrester Research, 27 April 2001..
Wolverton T, Sandoval G. Taxes threaten booming sales of cigarettes online. CNET News.com; 2000..
Streitfeld D. Online tobacco sales ignite fight over taxes.Washington Post. Washington DC; 2000:A01..
Fairclough G. New York banning cigarette sales by mail, Web blocked by judge's ruling. The Wall Street Journal Interactive Edition. New York, 2000..
Fairclough G. BAT unit sues to block New York law banning sale of cigarettes on the web. The Wall Street Journal Interactive Edition. New York, 2000..
Fairclough G. Judge throws out a state law banning Internet, mail-order sales of cigarettes. The Wall Street Journal Interactive Edition. New York, 11 June 2001..
Lehourites C. RI restricts Internet tobacco sales. Associated Press; 2000..
Scherer R. States crack down on web tobacco sales.The Christian Science Monitor. New York, NY; 2000..
Corkery M. Law bans web sale of tobacco to minors.Providence Journal-Bulletin. Providence, Rhode Island; 2000..
(2000) Cigars, youth, and the Internet link. Am J Public Health 90:790–792. (1998) Tobacco targeted at youth on the internet: an update. (Center for Media Education, December, Washington DC). Center for Media Education. Alcohol and tobacco on the web: new threats to youth. Washington DC: Center for Media Education; March,1997..
Fairclough G. BAT division will start taking phone, fax orders for cigarettes. The Wall Street Journal Interactive Edition. New York, 2000..